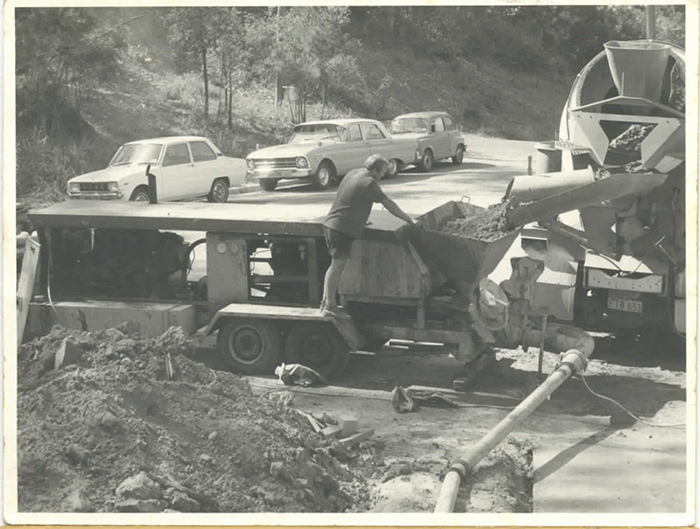 Transcrete was there in 1967 when concrete pumping was a totally new concept of moving concrete from Transit trucks to formwork through a 100 mm pipeline. 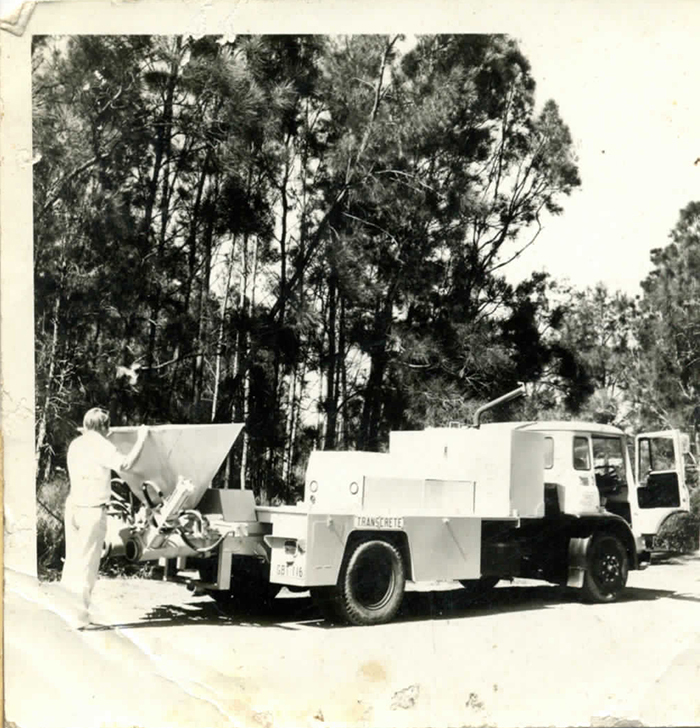 Nobody knew much about the concrete mix designs or pressures required to pump concrete. 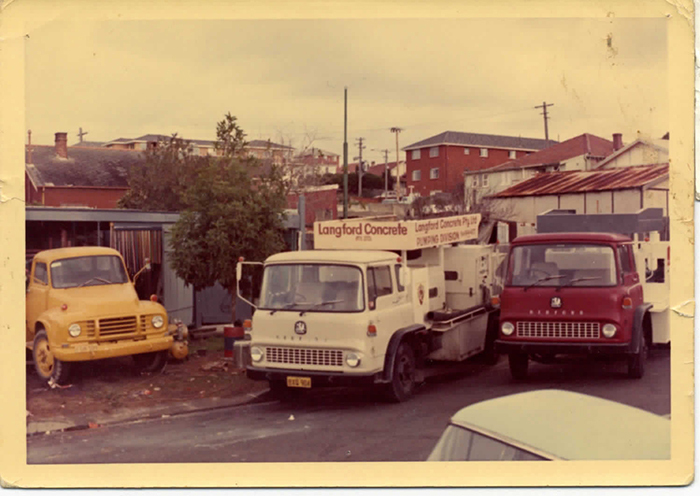 The concrete suppliers attitude was that their concrete meet Australian Standards … So if concrete was to be pumped … design a pump to pump it. Transcrete’s “plug valve” system used 4 independent inlet and discharge ports, thereby reducing the concrete bleeding problem experienced with German and USA pumps sold at that time. Our experience in concrete and mechanical engineering was a great help in designing a concrete pump to solve the problem. That is why Transcrete pumps are the Worlds Best. We were there from the start and others followed. Because we pumped concrete, we know what today’s pumpers require. This our the first days pumping for the Transcrete “protype” model 836. It had 200 mm x 925 mm concrete cylinders, powered by a 120 HP Cummins Diesel engine pumped 60 Cubic Yard per hour at 85 bar line pressure. This pump incorporated our “plug valve” bullet type system. 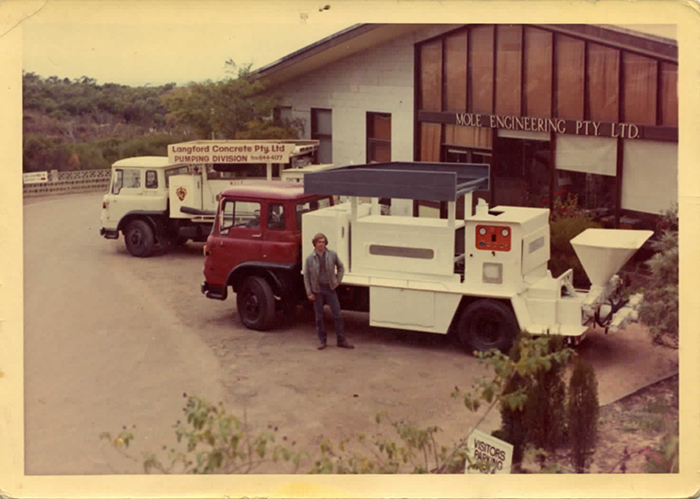 After successful field testing Transcrete pumps were sold under a marketing agreement with Mole Engineering at the time a company with branches in every state of Australia. The maroon pump was used to pump the 25 story Union Carbide building plus many other high rise buildings in Sydney. Pump was a the model 854 rated at 90 cubic Yard per hour model powered by a 180 HP diesel engine developing 85 bar line pressure. 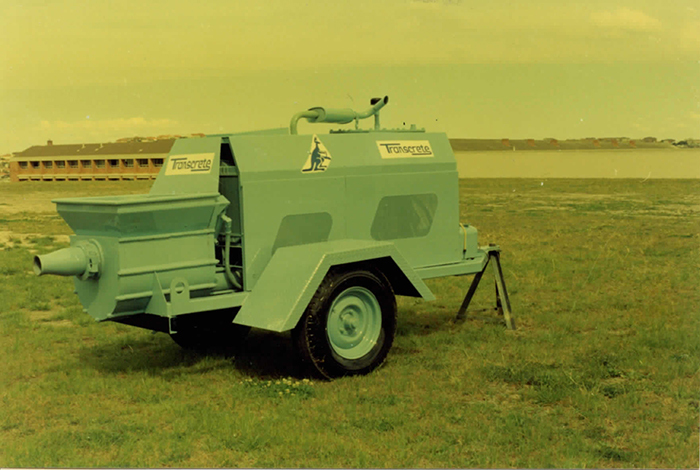 This is the one of first Transcrete model 854 line pump of the production line, manufactured by Transcrete pump and sold through Mole Engineering in 1969. Standard production models were 90 Cubic yards per hour with the 200 mm x 1,400 mm concrete cylinders and 180 HP diesel engines. To meet this new market requirement, Transcrete engineers developed the “Monoline” model 636, a small 40 cubic yard per hour trailer mounted pump with a completely new unique “one piece” concrete valve, which Transcrete called an “S-tube” valve. The “S-tube” eliminated over 35 moving parts, two wear parts instead of 12 wear parts. Wear part costs were reduced by $ thousands. This machine was the first pro-type S-tube used for field testing. 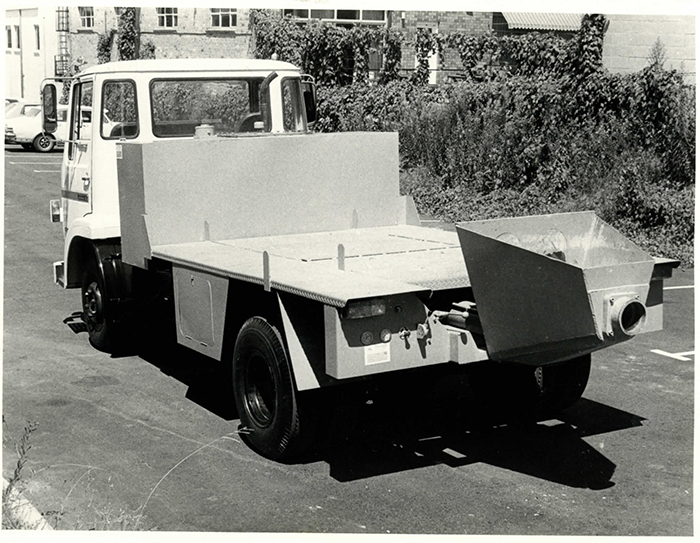 Powered by a 100 HP 6 cylinder petrol engine to reduce noise in residential areas, the Monoline developed 85 bar line pressure and had 152 mm x 925 mm concrete cylinders and a 152 mm S-tube. 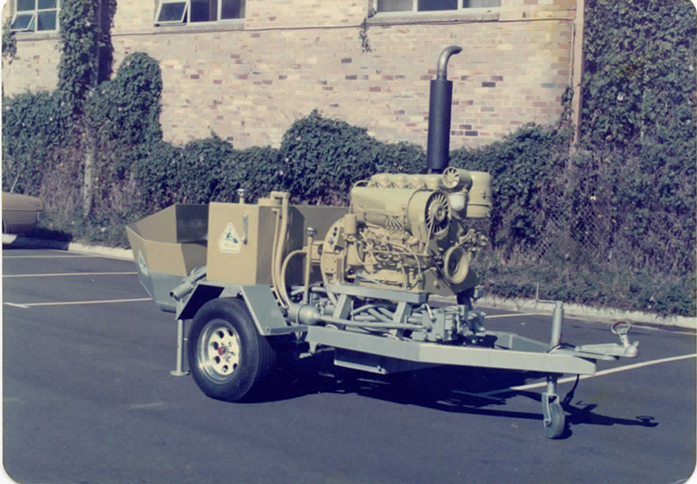 Transcrete cancelled the marketing agreement with Mole Engineering in 1971 and introduced the first truck mounted model 854 pumps using a full torque split tail-shaft PTO with a 180 HP diesel engines. Output was increased to 100 Cubic yards per hour. This pump is Transcrete’s first production S-tube pump. Renamed as the Sidewinder model, production started in 1975 and the pump was value engineered to be exported to the USA Market. The Sidewinder took the USA Market by storm. Transcrete air freighted 20 Sidewinders per month to our Los Angeles Dealers, Bennett Brothers. In 1980 Bennett Brothers, Transcrete America and Thomsen Equipment entered a joint venture and the Sidewinder was sold as a Thomsen Sidewinder until 1982 when Thomsen was taken over by a German Concrete Pump manufacturer. The Sidewinder was then sold as the Thomkatt.